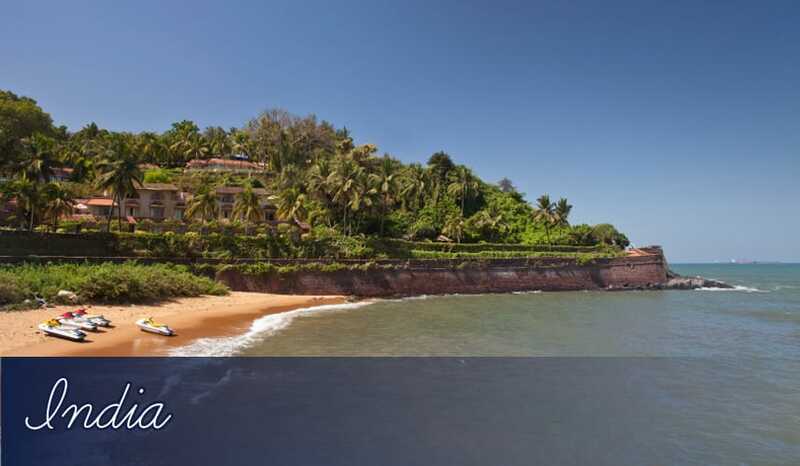 Beach holidays: Located on the golden coastline of Goa holidays, Calangute holidays boast a golden sandy beach which leads into the warm waters of the Arabian Sea. Calangute holidays also put you very close to a number of other inviting beaches including Candolim and Anjuna. It’s this thriving beach scene which attracts thousands people to have their holidays in Goa every year. Lush natural sights: Goa has an incredibly rich and diverse array of wildlife, and this is exemplified in the many natural parks, forests and animal sanctuaries near to where you’ll be staying on Calangute holidays. Less than 10km away you’ll discover two incredibly idyllic bird sanctuaries teeming with colourful parrots and flamingos. Cabo da Rama Fort: On Calangute holidays you’ll discover that this fort is quite unique in that it is one of the only forts to have been built before the Portuguese occupation. Indeed, the fort is actually named after Rama, the main character in an old Indian mythological epic. Despite its crumbling condition, the fort still holds a majestic allure, and the church of Santo Antonio inside the fortifications (which was actually built by the Portuguese) is still in amazingly good condition. Fort Arguada: Dating back to 1612, this Portuguese-built fort was created as a defence against possible attacks from the sea. The fort has had a fascinating history, from starting out as a strategic military structure and a freshwater spring for passing ships, then to a prison and today as part of a modern hotel complex which offers all inclusive holidays in Calangute! A white lighthouse was also built here in 1864 by the Portuguese, making it the oldest lighthouse in Asia. Our Lady of the Immaculate Conception: On the subject of landmark buildings, this supremely ornate church is also one of the oldest you’ll come across on Goa holidays. Many visitors on their holidays in Calangute come here to take in the beauty of the gleaming white facade and cascading stairways. The exterior also makes a focal point of a statue of the Virgin Mary and a large silver bell at the top of the tower. It’s also lit up wonderfully at night, so be sure to come back to take some pictures! Goa State Museum: Located in Paniji, the capital city of Goa around 15km away from Calangute holidays, this charming little museum has a variety of exhibits on display. On your visit here you’ll see carvings, statues and manuscripts relating to Goa’s intriguing and diverse history. Some artefacts are from the Hindu and Jain religions, although there are also works on display from the Portuguese Christian occupation too. Salmona Spring: This beautiful freshwater spring in the centre of Saligao village just 3km from Calangute holidays is a real respite from the hot sun in Goa. A short walk through the lush green jungle will take you to the source of the spring, where water cascades through moss covered rocks surrounded by dense green foliage. Near the foot of the spring you’ll come across a tranquil pool and a small Christian statue. The whole area is pure bliss! Chorao Sanctuary: You’ll find that this exotic bird sanctuary is just as much a sanctuary for those on their Calangute holidays as it is for the birds! Wander through swathes of green forest opening to natural lakes and try to catch a sight of the over 400 species of bird which come to nest or migrate here. The sanctuary also comprises a network of water channels which you can travel by boat, and if you’re lucky you may even spot crocodiles too! Calangute Beach: Known as the ‘Queen of the Beaches’ Calangute holidays boast the best beach in Goa. It’s a long, wide stretch of soft golden sand which leads to warm, shimmering waters. But perhaps the most interesting thing about this beach is that it’s a hive of activity throughout the day. You’ll see masseuses offering their services, snake charmers, and fruit sellers amongst others during your time on this atmospheric beach. Candolim Beach: Located just a little south of Calangute holidays, Candolim beach is a little quieter than the more famous, centrally located Calangute Beach. However it still has plenty to take your interest during your holidays, from a huge variety of water sports out to sea to rustic beach bars and shacks selling all sorts of food and drinks. Anjuna Beach: Anjuna is less than 1km north of Calangute Beach and its golden sand and tranquil atmosphere certainly make it an idyllic spot for relaxing on your Calangute holidays. It’s one of the first places to have caught the travelling hippies’ attention over fifty years ago, and it’s easy to see why. It’s also home to a wonderful flea market where you can find variety of different colourful keepsakes to bring back home with you. Chef Soumyen Kitchen: Rather unusually for a restaurant in Calangute, Chef Soumyen only serves European food, but that’s great if you fancy a change from the typical Indian cuisine offered elsewhere. Dishes include classics such as fillet steak, fish and chips and grilled lobster. I 95: In beautiful open-air surroundings with rustic wooden furniture and soft lighting, you’ll certainly find the atmosphere here will make your eating experience even more enjoyable during your Calangute holidays. The contemporary-style dishes are creatively presented too, with meals such as maple pork chops, beef wellington and grilled king prawns. Le Jardin: Another restaurant with a truly stunning setting, featuring a grassy courtyard surrounded by overhead verandas. Not afraid of trying adventurous ideas, the menu features interesting dishes such as beef Carpaccio with ice cream, fish in lime and coriander and baked chocolate mousse. Clubbing holidays: Goa is one of the original clubbing capitals, and it could even be said to be the place where the holiday nightlife scene started. Certainly, Ibiza holidays took much inspiration from the nightlife on Goa holidays. Tito’s Road in Baga to the north of Calangute holidays is a great place to start. It’s here you’ll find the lively nightspot complex of the same name, Tito’s, as well as the open-air bar Mambo’s and Kamaki, which has the TVs to accommodate your sports viewing. There are many more clubs to visit on Calangute holidays too, such as Club Enaya, Club Cubana, and Club in the Sky. Plus, some of the beach shacks double as both cafes serving tasty snacks and lively bars for partying on the beach. The most popular of these include Aggie’s Cafe and Nine Bar, both of which have a real community spirit, so you’re sure to make lots of new friends here. Vibrant markets: The hippies which came to Goa in the sixties have certainly made their mark when it comes to shopping on Calangute holidays! The best example of this is the famed flea market in Anjuna – right by the beach this vibrant market offers all manner of items, from carvings and musical instruments to trinkets and trance CDs. It takes place every Wednesday, taking up a significant stretch of this golden slice of coastline. Whilst Anjuna’s market is the most famous, you’ll find these flea markets dotted along almost every beach, including those on Dona Paula, as well as ones in the villages of Ponda and Ingos. The Ingo night market in particular is well worth visiting, as there are lots of stalls offering tasty food, exotic cocktails and lively performances.